The F.A.Q. post has been added for a recap about all my 30 under 30 items. For my 30th birthday I decided to do a 30 Under 30 list. 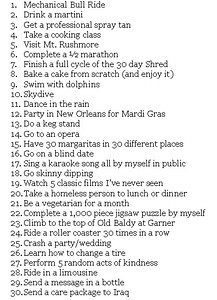 I have chosen 30 things to do before I turn 30 in May. I will be updating everyone on my progress below. Enjoy! List Items that are completed, the ones that do not have a link beside them have recaps that are coming soon! #3-Get a professional spray tan-Complete! #7-Finish a full cycle of the 30 day Shred-Complete! #8-Bake a cake from scratch (and enjoy it)-Complete! #12-Party in New Orleans for Mardi Gras-Complete! #15-Have 30 margaritas in 30 different places-Complete! #16-Go on a blind date-Complete! #17-Sing a karaoke song all by myself in public-Complete! #19-Watch 5 Classic movies I have never seen-Complete! #20-Take a homeless person out to lunch or dinner- Complete! #21-Be a vegetarian for a month-Complete! #22-Complete a 1,000 piece jigsaw puzzle by myself-Complete! #23-Climb to the top of Old Baldy at Garner-Complete! #24-Ride a rollercoaster 30 times in a row-Complete! #25-Crash a party or a wedding-Complete! #26-Learn how to change a tire-Complete! #27-Perform 5 random acts of kindness-Complete! #29-Send a message in a bottle-Complete! #30﻿-Send a care package to Iraq-Complete!